004.Andre Sier – JavaMuseum 2010 – Celebrate! André Sier (1977, Lisboa) is an audiovisual artist-programmer. Has a degree in Philosophy (FCSH, 2005), having also studied Painting and Sculpture at Ar.Co. Produces objects that installs in exhibiting spaces since 1997.
k. is a free adaptation of the imagery experimented by K. in ‘The Castle’ by Franz Kafka (1924), that transports the user in a vertiginous voyage through spatial abstraction. ambient labyrinth tridimensional indetermined navigable open continuous complex cyclic. Space Race #1 is a 3d simulation in which teams of autonomous elements compete for a mysterious green fuel, that allows for a spaceship, the only possible way of escaping, to take them to another planet, the next level of the game. The team members are always organized and operating according to the team’s internal logic, either it being looking for the spaceship and running to it, gathering fuel and working either together or independently. Each member is characterized by unique features and each group is organized in swarms that perform the required tasks in order to achieve their goal, conquering the spaceship and traveling to another world. When they arrive to the new planet, they alert the local population that they are ready to compete with them in search of fuel for the next spaceship that will, once again, transport them to yet another planet. Space Race #1 follows and repeats this logic endlessly, taking on the structure of an abstract computer game, where accomplishing certain tasks and defeating the enemy allows the team to reach subsequent levels. But reaching another level never brings the teams closer to the end of their missions. This space race has no visible end or any kind of possible gameplay for us to interact with it. 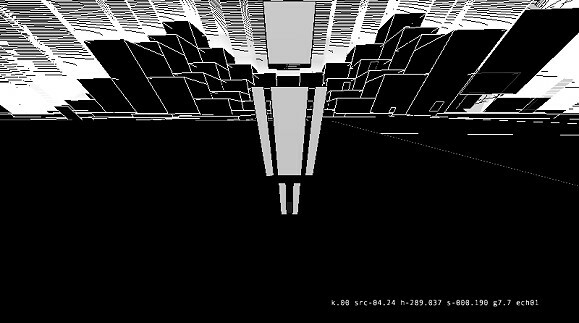 It is an abstract generative fantasy that explores the language, codes and strategies of contemporary computer gaming. The planetoids in the galaxies are populated with teams of autonomous agents that compete among themselves, exploring continually the green fuel resources, growing bases that accumulate it, to take their ships to new planets, discovering new galaxies, in unending voyages. 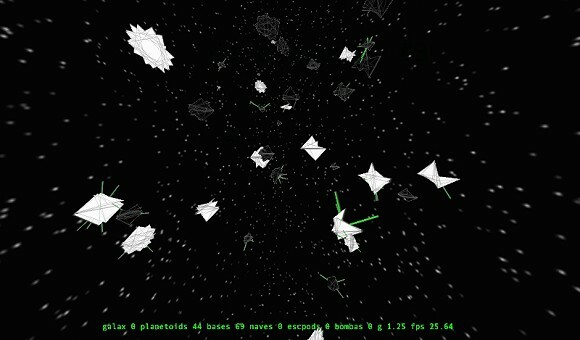 Space Race #3 is a tridimensional generative work that simulates stochastically the space exploration; we observe from the universes’ point of view the balance of each planetoid system, the ships launched in space moving according to the gravitational fields generated by the planetoids, reaching new worlds and refueling, or exploding in the air and ejecting escape pods, making networks of chaotic chartographies across space. The never ending resource exploration changes the balance and induces inevitable collapses in the planetoids systems, under the shape of small big bangs, carrying the point of view to visit other galaxies. ‘CorpssansOrganes’ (CsO) is a seminal concept in Deleuzian philosophy. Made after Artaud declared war on the organs, it is a text that influences cyberculture, disrupts organization, and prompts this work. 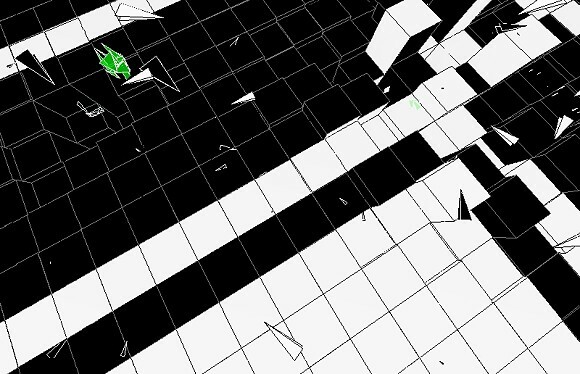 This ‘CsO’ is a work launched in 28 nov 2008, which visualizes and scatters every word of Gilles Deleuze’s & Felix Guattari’s text in 3d abstract space, celebrating 61 years since 28 Nov 1947, date that marks the banished end of Antonin Artaud’s radio broadcast ‘pour en finir avec le jugement de dieu’, that prompted this deleuzian concept. 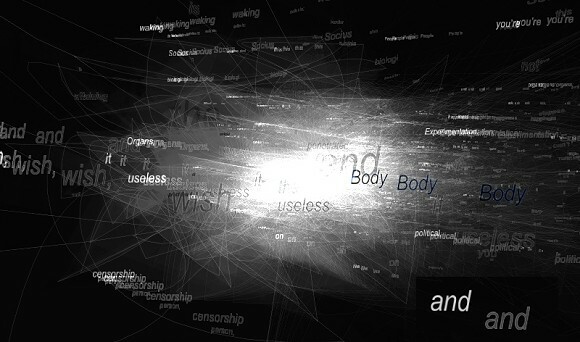 All the words of this text from Mille Plateaux are floating in space, disembodied from their pages, interconnected by a luminous filament; the code follows every word in reading order, embodying a meta-body-without-organs in 3d space, charting diffuse abstract paths united by generative logic’s thread.